Does Skin Brushing Really Work? What does rubbing a coarse-bristled brush over your skin have to do with your health? Skin brushing, however, is super affordable and achievable. I have “alligator skin” sometimes, which is a very common side effect of having Hashimoto’s disease. For many years I looked for something that would manage that problem because no amount of moisturizing was able to deal with it. Let me back up a second. When I say “alligator skin,” that’s kind of an inside joke, but what I mean by that is the skin, especially on my legs, but also in a few other places like my forearms, becomes extremely dry, flaking off in almost a honeycomb pattern. If I don’t get those dead skin cells off before I wash or shave, the results can be really gross. Sometimes the dead skin rolls up after getting waterlogged, gets stuck in the razor, and almost takes on a rubbery texture, making it absolutely impossible to get off! This isn’t just me, is it? * Crickets * Well, okay, moving on…. Of course, before I claim that all of these benefits are accurate, I’d want to get a few more experts on board. For me, removing the dead skin cells and getting smoother, softer skin is a big plus all by itself, so I’m not sure if I even care whether the rest of it is true. I’ve tried every kind of salt and sugar scrub imaginable and none of them have ever done the trick. In fact, they seem to add to the build up on my skin, which is definitely not the look or feel I’m going for. Next, I’ll explain how it do it, but go ahead and scroll down to the end if you want to know more about what the experts say about Goop’s claims before you decide. 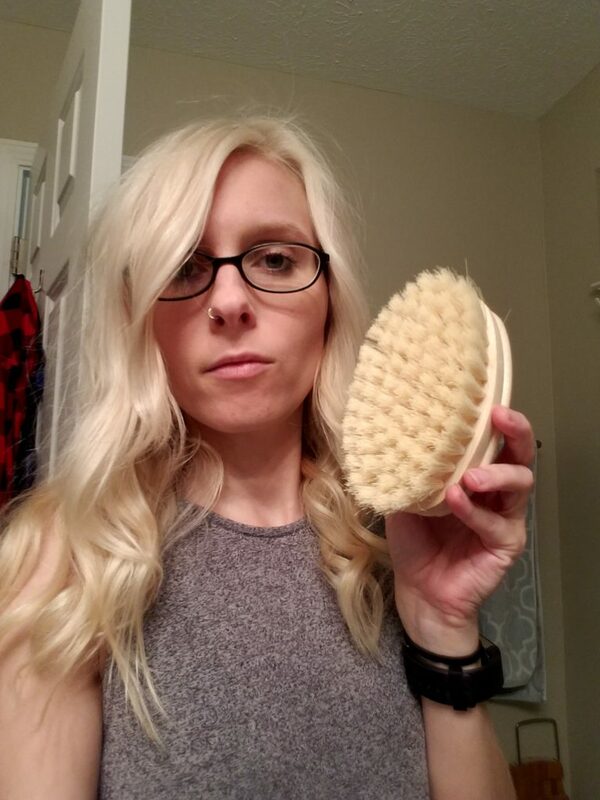 First, I bought a brush, and just like the instructions say, it’s not too soft and it’s not too rough. Actually, when I run my fingers over the bristles, it feels just right, but when applied to the skin, it made me cringe at first. However, I didn’t want to go softer and risk not actually being able to brush away the dead skin cells. I need those gone! I try to follow the appropriate strokes detailed in the Goop article above–long sweeping strokes starting at the legs and then moving to the arms–except I start by using more of the edges of the brush rather than applying the whole thing directly to my skin. It takes a moment for the nerves to get used to the process. If you break or scratch the skin in any way, that’s how you know your brush is too rough! Skin brushing should remove the dead skin, but should never penetrate the dermal layer or cause skin to become red and irritated. Note: Unlike the instructions from the Goop article, I choose not to apply oil to the brush because my goal is to sweep away all the dead skin cells before a shower or bath, not get it all stuck in the oil like what happens with a body scrub. If I’m shaving, I use a nice shaving lotion to soothe everything during my shower or bath. For me, hydration comes after. After my bath or shower and shaving, I moisturize the areas that were brushed. Personally, I feel that lotion does a number on my skin, adding to the gooey build-up that sometimes occurs when those dead skin cells don’t come off. Plus, lotions are made of all kinds of weird ingredients, unless you make it yourself or purchase a trusted brand. Other options include coconut oil and aloe vera. Coconut oil is natural moisturizer, plus has a number of health benefits, according to Dr. Rhonda Patrick. Personally, I think coconut oil is too oily for my skin most of the year and if I use it a few days in a row, it doesn’t seem to absorb very well. I prefer to use natural aloe vera gel as a moisturizer (or rather more of a skin refresher) most of the time. It’s also extremely refreshing after the effects of exfoliating. So, does it really do what they say? To be honest, the jury is still out this. I personally enjoy getting rid of that flaky, icky skin a few times a week, but certainly not every single day! The only experts I’ve found who tout skin brushing are of the pseudoscience variety, and while that does not bother me because of my complicated history with the “legitimate medical community,” I want to make sure we all recognize that this practice may not be quite as powerful as it claims to be. I’m fine with using this practice for the notable benefits and if the other benefits exist, all the better! Does it feel good? Yes. Does it make my skin feel healthier? YES.